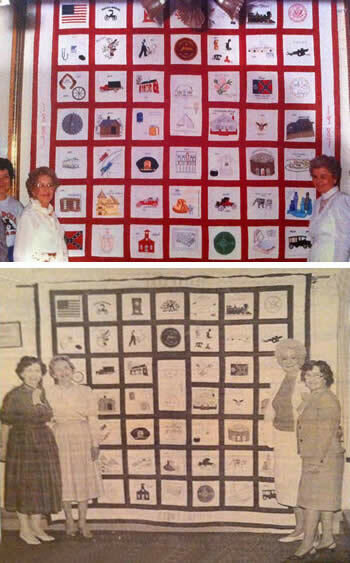 In 1987, as part of the Centennial Celebration of East Point’s founding in 1887, the East Point Woman’s Club created a quilt illustrating East Point history, historic landmarks and prominent businesses. The quilt features 49 squares that were embroidered or appliquéd by hand by 26 members of the Woman’s Club. Long-time EPHS member Mildred Finnell who was chairman of the Woman’s Club art department at the time, designed many of the squares and oversaw making of the quilt. Mrs. Finnell said she called on club members to identify personal recollections of East Point history and then transfer those ideas to the individual squares. Club members then spent 1200 hours at quilting bees piecing together and quilting this history of East Point in needlework. The quilt hung in the foyer of East Point’s City Auditorium until late October 2011 when the East Point Preservation Alliance and the East Point Historical Society negotiated an agreement with the City for the Historical Society to take temporary possession of the quilt for safe storage and display. The East Point Historical Society is assuming responsibility for the Centennial Quilt, its safekeeping and display in memory of Steven Bramlett, the Society’s devoted volunteer curator, who died in April 2011. The quilt is a wonderful illustration of East Point’s history and is itself a historical artifact. 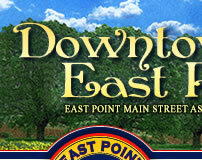 A sampling of the squares includes City Hall, the Buggy Works, Connally Mill and South Fulton Hospital. In upcoming issues, we’ll show how the quilt’s individual squares tell East Point’s history in unique and beautiful pieces of craftsmanship and artwork. You can visit the Historical Society on Thursday and Saturday after-noons to view the quilt firsthand. - Carole Griffith, former EPHS Board Member and long time EPHS Member.